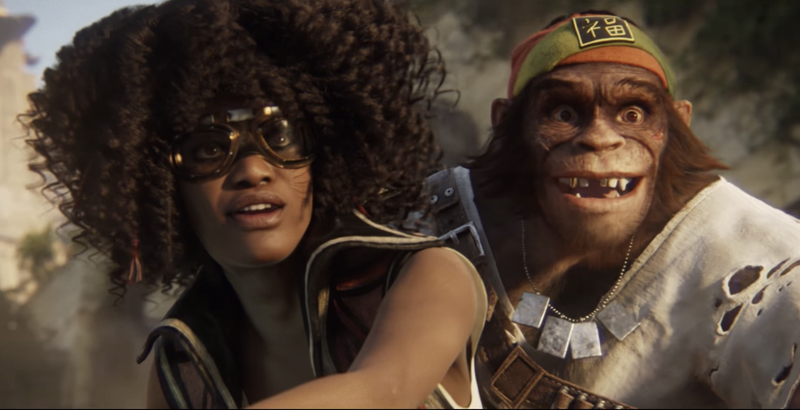 Ubisoft hit the stage Monday afternoon at E3 to show a new trailer for Beyond Good & Evil 2, along with some other stuff that was completely overshadowed by the fact that OH MAN THEY ACTUALLY SHOWED BEYOND GOOD & EVIL 2. It was a brisk show that didn’t waste much time on games we’d already seen or that Ubisoft had already shown at other press conferences. Let’s break it all down. Mario + Rabbids Looks Like... Nintendo XCOM? Legendary Nintendo designer Shigeru Miyamoto came out on stage to talk more about Mario + Rabbids: Kingdom Battle, a Ubisoft-developed Switch game that’s been leaking onto the Internet for a while. It’s nice that Ubisoft gave Miyamoto a chance to make one of his trademark dramatic entrances, since Nintendo isn’t doing live shows anymore. As for the game itself, it actually looks... good? Stupid Rabbids stuff aside, I mean. It’s a mix of open world exploration with turn-based tactics fights, almost like XCOM. I wasn’t expecting that either, and... I mean... I love games that are like XCOM. For all the jokes everyone made about the stupid Rabbids, the best joke of all may wind up being that the game is great. It’ll be out on Switch on August 29. Remember how at the Microsoft press conference they had Terry Crews introduce Crackdown 3? Unfortunately, Ubisoft’s open world racing game The Crew does not feature Terry Crews. It does feature a lot of cars and graphics, however, as well as planes, as evidenced in the nifty announcement trailer. It’ll be out in Early 2018. Transference, A Creepy And Mysterious VR Game. Elijah Wood and a few other people went slightly meta as they introduced Transference, a VR game that we don’t know much about other than that it’s weird, and in VR. Skull & Bones Takes Piracy Beyond Assassin’s Creed. This one had been rumored for a while and actually leaked in the middle of Ubisoft’s press conference, but now it’s safely out in the open. Skull & Bones takes the pirate stuff that everyone liked in Assassin’s Creed: Black Flag and removes all that Assassin’s Creed lore baggage. Ubisoft showed PvP during their press conference, but based on the dev diary they posted, it sounds like there’s a lot more in the game than just PvP sea battles. Starlink: Battle of Atlas Has You Attach Toys To Your Game Controller. The game itself looks neat enough, but I don’t know if I need more stuff cluttering up my desk. If you’re into toys, though, this could be a big game for you! The Far Cry 5 gameplay demo featured Boomer the dog. A lot of this was along the lines of what Stephen saw back when the game was announced. Sneaking, scouting, sniping, and calling in Boomer, the “fang for hire,” who stole the show. Who’s a good boy? Boomer is a good boy. The rest of the game looks cool too, I guess. Boomer better not die though. Michel Ancel came out on stage and cried and everything. I have to go back and watch that trailer again because I think I blacked out for half of it. The game is a prequel, set “before the birth of Jade.” For reference, the first Beyond Good & Evil came out in 2003, almost 15 years ago. Ubisoft has long said Ancel is working on a sequel, but the game has been M.I.A. for years. Ancel did a breakdown of the new trailer here. It will probably be like five more years until it comes out, but hopefully the Internet-wide freakout that will follow that trailer will indicate to Ubisoft that yes, they should probably make sure the game finally gets finished. Couple other things: A new trailer for South Park: The Fractured But Whole, the usual silly live musical performance promoting Just Dance 2018 (out in October), a mobile South Park game called South Park Phone Destroyer (coming this year), and Steep is getting an Olympic expansion. That does it for Ubisoft. We’ll be back later tonight for Sony’s big show, and will be covering E3 throughout the rest of the week with news, liveblogs, podcasts, and videos.